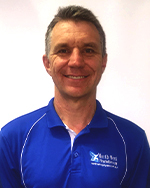 Roger McIntosh established North West Physiotherapy in 1996 after working as a senior physiotherapist in both the private and public sectors in Australia and the UK. Since then, the practice has gone from strength to strength, winning acclaim and accolades from the local business community. Roger has worked as a physiotherapist for the South Queensland Crushers Rugby League team in the NRL and has since worked as physiotherapist for Queensland Cup Rugby League teams and Brisbane Premier League soccer teams. Roger is also strongly affiliated with North West Hospital. A strong believer in developing staff to their full potential, Roger provides leadership and support to all staff at North West Physiotherapy to help them achieve their goals. For the past four years, Roger has been recognized by the Quest Newspaper Achiever Awards. Roger’s personable and trusting style is based on mutual respect and open, honest communication. He brings this commitment to all elements of the practice to ensure North West Physiotherapy meets your every need. Married, with three boys, Roger has a passion for coaching junior sporting teams and is a member of several sporting clubs including Mitchelton FC and West Arana RLFC.